Determined to get that fresh lick of paint on once and for all? Follow Richard Burr’s step-by-step guide. So, a weekend’s coming up when you’ve got nothing planned – time to decorate that room you’ve been putting off for ages. 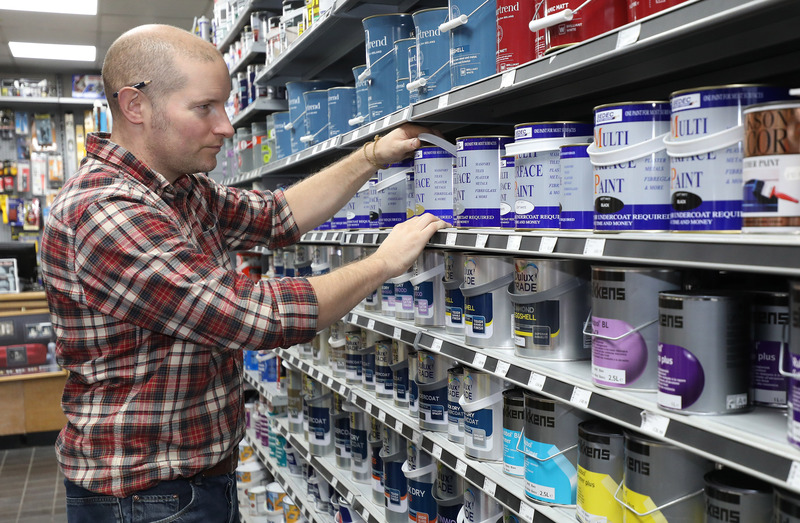 When it comes to choosing paint, the choice is endless. My local DIY store, Designer Colours, can mix up any precise colour you like. You can take in an item and they’ll scan and colour-match it for you. To work out how much paint you need, calculate the area of your ceiling and walls, and remember you’ll be doing two coats. A 5L tin covers about 50m2, but this can totally depend on the thickness of your paint, so check the back of the tin. I’d recommend using acrylic undercoat and top coat, as it has a quicker drying time and less fumes. Do not use an oil-based and an acrylic paint together. If you use an oil-based paint, you’ll need white spirit. Everything else washes off with water. There is no point walking into a room, cracking open a tin of paint and slopping it over all the exposed surfaces you can see. You need to prep – this takes a few hours, but will make the whole job easier, cheaper, better and, most importantly, you won’t spill paint all over the sofa. If you’re doing this over a weekend, I’d recommend doing as much of this prep on the Friday night, so you have more time to paint on the following days. Start by moving all the heavy stuff (sofas, beds, bookshelves, TVs) in the room into the centre, leaving at least a 30cm gap between your furniture and your walls all around. Next, take down any curtains, blinds or nets and lay these on the furniture. Now lay any wall hangings, pictures and light shades on your curtains, and cover the whole thing up with plastic sheeting. Try to avoid cotton or twill sheeting – this won’t keep dust out or big blobs of paint (if you drop any). With your valuables covered up, it’s time for a bit of sanding. Using 80-grit sandpaper, lightly rub all your woodwork – the skirtings, architraves and doors. Make sure to rub only the face of the door that looks into the room, unless you’re planning on decorating the hall too. Once all the sanding is done, get the vacuum cleaner out and give everything a thorough clean, making sure not to miss the tops of the doors, architraves and skirtings. You may need to clean the woodwork with a damp cloth and some washing-up liquid. I’m not judging you on your cleanliness, but some rooms can be greasy and paint doesn’t stick to grease. Now you are cleared, sanded and cleaned, it’s time for the masking. Use 50mm decorators’ tape to mask where your floor meets the skirting boards. Whether your floor is carpeted or smooth-surfaced, it is a good idea to do this, as it stops drips and saves you from having to cut-in the paintwork against the floor (painting a straight, neat line around the boundary and then ‘colouring in’ inside the lines). If you are planning on painting around wooden windows, you can mask these up too – it takes ages, but saves much more time in cutting-in and scraping paint off of glass. With the masking all done, all you need to do is put plastic sheeting on the floor (you can cut a large plastic sheet into long wide strips with scissors – this will make it a lot more useful) and after all that, you’re finally ready for the fun stuff! So, today I'm painting yellow walls more yellow. If you have anything yellow in your house that you think could do with being just that little bit more yellow, just give me a shout! Paint the ceilings first – that way any drips or spots will not muck up other bits you’ve already done. Use a 4” brush to paint around the top edge of your ceiling. If you’re painting the walls later, you don’t need to cut this ceiling paint into them, as you’ll be painting over the top. Once you’ve painted around the edges of the ceiling, use the same brush to cut in around any lights you have. With the edges still wet with paint, use a roller to put the first coat on the ceiling. Pour some of your paint into your roller tray and begin painting. Start in the corner of the room and work outwards from there, painting in small sections and always rolling back into your wet work. Once the first ceiling coat is done, wrap the roller in a plastic bag and start undercoating the woodwork. To undercoat, take your 2” brush and start painting the skirting. Because you haven’t put any paint on the walls yet, you can coat the woodwork with no need to cut-in – this will make the work go much faster. Once the undercoat is done, your ceiling should be dry enough to lay on your second coat. Use your 4” brush again to paint the edges of the ceiling, and then roller the rest. Wash the roller out and leave it to dry. You now have an hour or two to go outside and get some fresh air before you start the final stretch. When your undercoated woodwork has dried, you can start painting the walls. Working on one at a time, use the 2” brush to cut-in the line between the walls, woodwork and ceiling. Once one wall is fully cut-in (including around the light switches, sockets and any wall-mounted light fittings), pour some paint into the well of the roller tray and start painting the wall. Start in one corner and roll up and down (rather than side to side), making sure you cover a roller width of the wall fully from top to bottom before moving on to the rest of it – this way, you’ll always have a wet edge of paint to roll onto, which will reduce your chances of having any streaks. Once you’ve finished rolling one wall, repeat the cutting and rolling process for every other wall in the room. 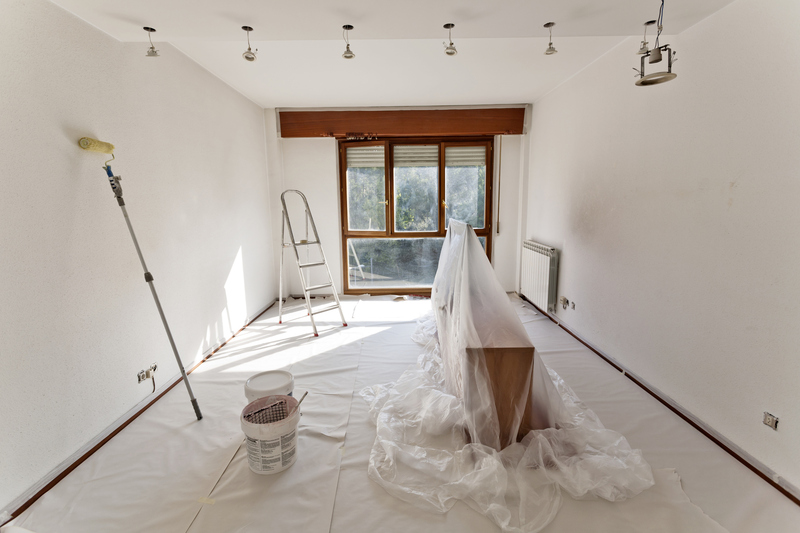 Depending on how fast you are at painting, or how big your room is, by the time you’ve painted all the way around your room, the wall that you started on should be dry, or at least nearly dry. Once it is, you can paint on your second coat in the same way as you did the first. Then, clean out your brushes and roller before the paint dries on them. Now for the last bit of painting. Use some fine sandpaper to lightly brush any imperfections off your undercoated woodwork – don’t rub too hard or you’ll go through the undercoat and have to repaint it. Whichever topcoat you choose for your woodwork, be aware that it is most likely to drip easily – drips that will show on your finished job – so be careful not to load too much paint on your brush. For the last coat, use a 2” brush on the woodwork. 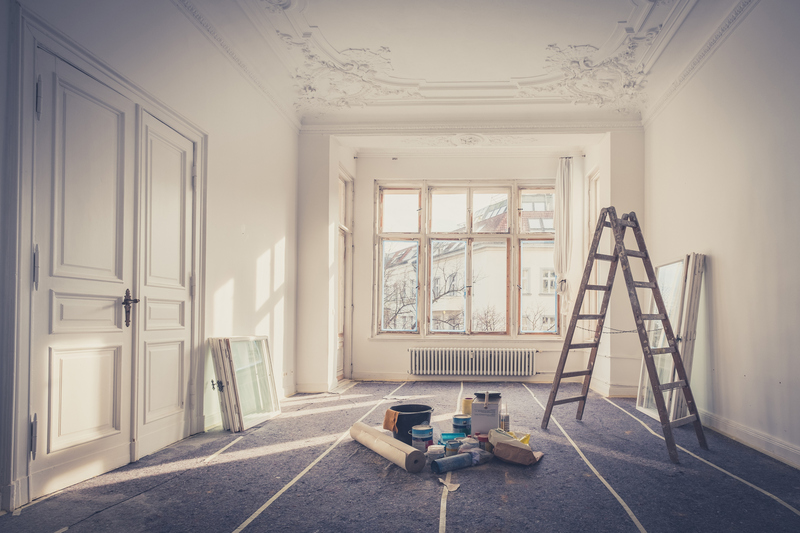 Paint the architraves and skirting boards first, remembering to keep an eye on the paint you’ve recently applied – you can use your brush to wipe away drips you might not have noticed earlier on, if your paint is still wet. Lastly, paint the door. Paint the mouldings around the panels first, then the panels themselves, then the broad strips of wood that make up the rest of the door. Brush the paint in the same direction as the grain of the wood (this will be easy to see if you look closely at the door). Leave this final coat of paint to dry fully (usually overnight) before peeling off all the masking tape and rolling up all of your plastic sheeting. After having protected your room for all this work, your plastic sheets will be in pretty poor condition, so roll them in on themselves to contain all the dust, paint and rubbish, and put them straight in the bin. Put back all wall hangings, curtains and light fittings and rearrange all the furniture, before flopping onto the sofa for a well-earned cup of tea.